Back to town from the Island. Coming home on Monday. 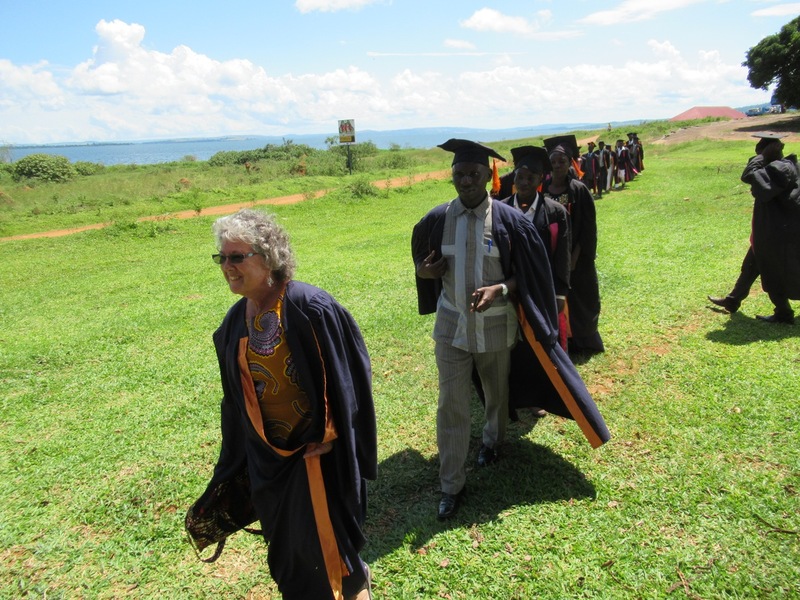 We have now completed the first official graduation of students from a course of study at the Lake Victoria Bible Institutes, Buvuma Section. We issued 20 Certificates of Graduation and nine Certificates of Discipleship for a total of 29 student certificates. When I started the Institute program in 2014, I did not know…well, a lot of things. 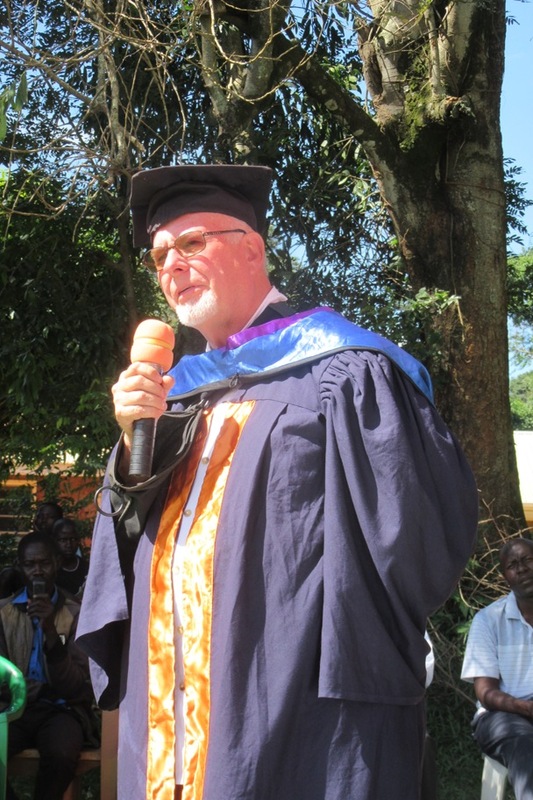 I did not know how the pastors and leaders of Ugandan churches would respond to the opportunity I was suggesting to them – to train them in basic biblical churchmanship, theology and life application. I did not know even the idea of giving exams in Uganda for certificates. I did not know until I stood up to give my small portion of the many talks and speeches shared at the ceremony yesterday that the reason for the examination was not for me to be certain they had grasped the information, but rather for the students to demonstrate to themselves that they had learned this material. I realized as I stood and gazed proudly across at them sitting in their robes and graduation hats that these students when I first met them had felt beaten down, isolated and neglected by their circumstances. But now this program has lifted them to a new level. Gail and I needed them to discover that truth for themselves, and somehow, the exams accomplished that. Through the difficult rite of passage represented by the testing, the certificate became much more than a piece of paper to these students. 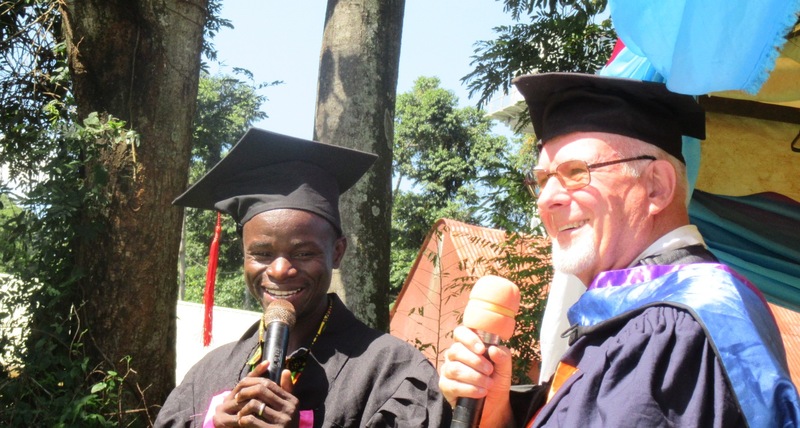 The hard-earned certificate became a symbol of over 200 hours of classroom study that, according to their own testimonies, has effectively changed many of their paths as church leaders and believers. I did not know at first why God required these tests, but I do now –the students needed them. Gail passes out and monitors the written exams. I did not know that so many would stick with the program year after year, coming together for a week at a time to receive the training over three and a half years. We have over 250 students registered in the program, but there is a strong core of about 120 who are committed and who show up every time we come. The fewest hours registered for any of these graduates was 210 hours of class time, and the highest was 270, which represents being present at every single session since I first began with a two-day church planting conference in 2014. I did not know that when I finished my first teaching on the island in 2014 and a man stood up in the back of the class and begged me through an interpreter, “Please, we have no teaching. 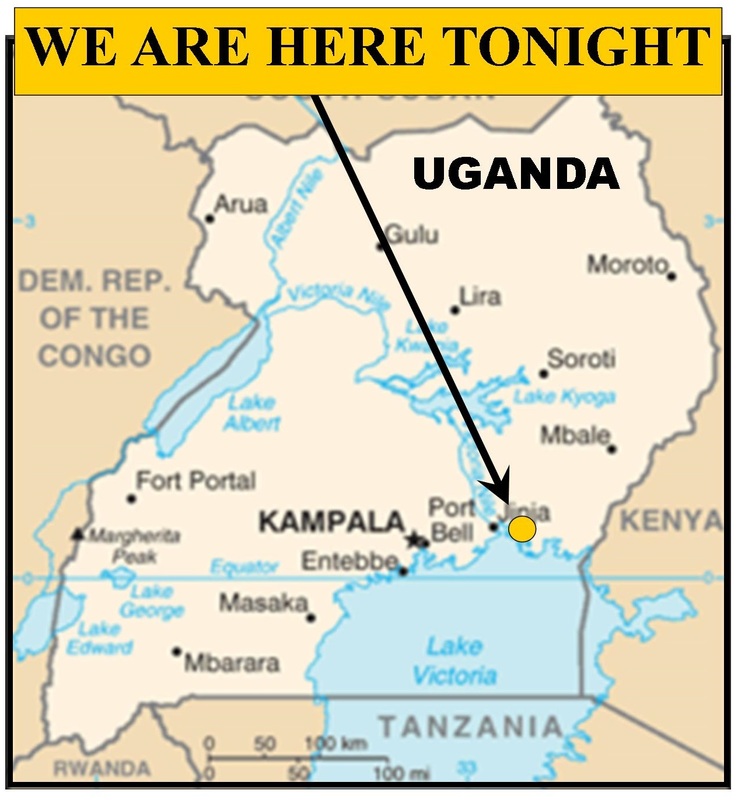 Please come and teach us….” that the Institute program that we developed in response to that request would in such a short amount of time expand across Uganda to nine centers from west to east, and south to north. Truly, this heart-cry was a request which no teacher could deny, and it has changed my life and theirs. Bob administers the oral exams. I did not know that every time we come to Uganda the Lord would open new doors for other centers until we have so many requests that we can’t cover them all. The first time it happened, He whispered, “Look to the water,” before I had even left the US and before I even knew there were any people living in the islands of the lake, let alone 250,000 of them. That gentle little whisper is what led me to Buvuma Island the first time. And that still, small Voice still speaks today, repeatedly opening up new frontiers. 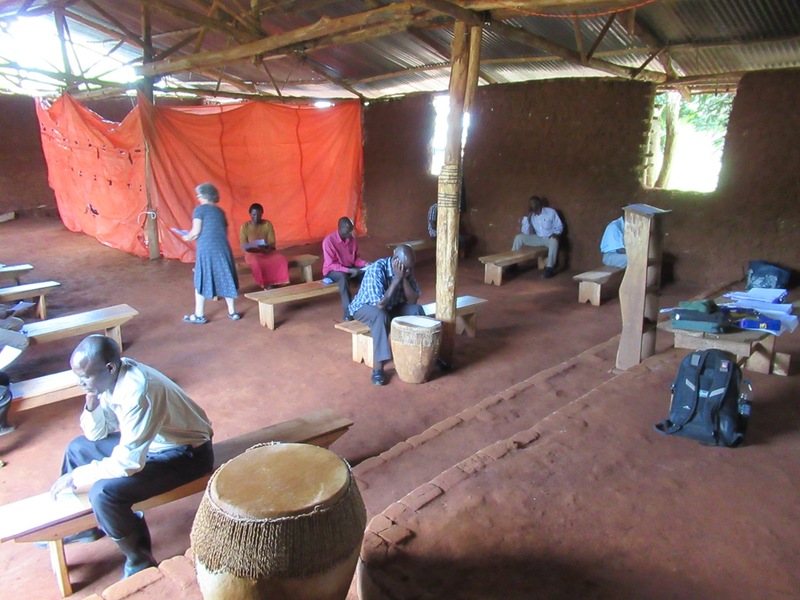 I did not know at the beginning that God would raise up indigenous Ugandan teachers to carry this Institute ministry forward when I one day can no longer come. Yet, in this graduating group alone, there are at least three and maybe four who will form the core of just such a group over the next two years, gifted teachers who can carry this ministry. The students took these tests very seriously. All of these things collided in my mind and heart as I sat through the ceremony on the island in the front row, in front of OUR students who were about to receive their certificates. As I listened to the many speeches from guest pastors and local government leaders exhorting them to take their teaching and apply it in their churches, I reflected on the three preceding days of examinations. This had been a grueling ordeal for them because they fear evaluation, especially testing. 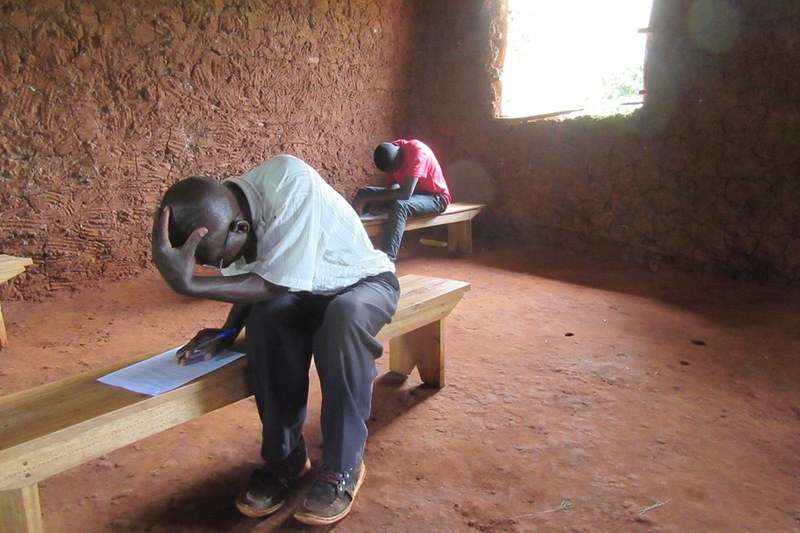 We gave eight separate written exams to those who could read English, and eight separate oral exams to those who could not read English or could not read at all but still managed to study and prepare for the exams. I was able to use the exam process occasionally to re-teach as needed, often branching from a difficult concept that all the students were still struggling with to teach the concept one more time, followed by more penetrating questions to make sure they had it. The graduates proudly march in, led by no other than the ever-popular Mama Gail, dressed in the robe they insisted she wear for the ceremony. I thought of one student from Tuesday’s oral Stewardship exam who couldn’t answer a question about the difference between Law and Grace, which is very difficult for many to grasp since most native church teaching can be quite legalistic. I led him and the other students back through this teaching. I will never forget this student’s final response to my question, “Why, then, if we are free from the Law, would a Christian ever give a sacrificial tithe to the Lord, since it is not required by Law?” The light finally glistened in his eyes as he said without further prompting, “Because we love Him so much.” Finally, he “got” grace. Finally, he understood. My eyes teared up and chills danced along my spine. What did it matter that we were in the middle of exams, and this was “old” information that I had previously taught? He finally “got” it, and it was the exam that brought him to that point! I passed him for the Stewardship exam without further questioning. Though we had three students who passed with honors, getting 100% on half of their tests and high scores on the others, we did have several who could not academically pass the exams. We had previously decided that the exams would be a positive learning experience as much as possible for all the students, and so we were perplexed how to deal with these students supportively while still holding them accountable for the material. 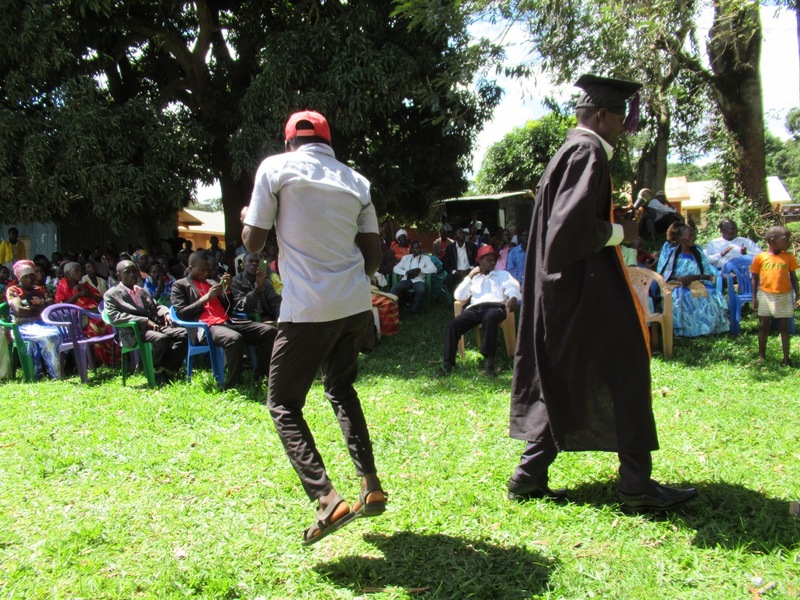 And though I offered a Discipleship Certificate to those who chose not to take the exam and those who could not pass it, most wanted the Graduation Certificate which required exams – they did not want to fail. On the spot, Gail (and the Lord, I am certain) suggested an intensive final interview where she would ask them what they had learned at the Institute classes and how they were applying it in their lives and churches. 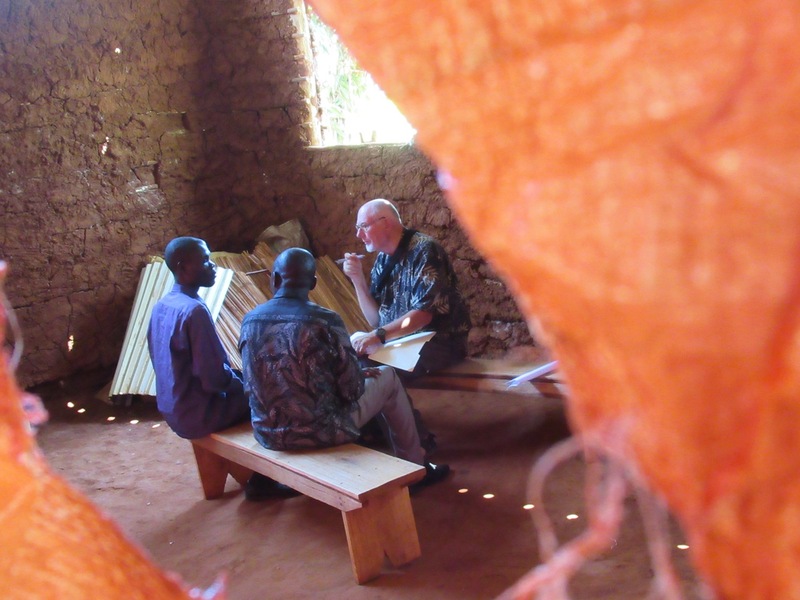 Doing this, we were surprised to uncover even more newly planted churches that they had neglected to tell us about, and to our further delight, the students revealed a flood of practical applications of all the teaching going on in the island churches that we had not yet heard about. The interviews resulted in passing more students who obviously knew the material in a practical sense, if not an academic one. This has instructed us and opened up a new and very valid testing mechanism that we will now develop for the future. My head was swimming with all the things the students and I had gone through together over 3 and a half years that brought us to this moment. Finally, I stood with other community leaders to present the certificates and joyfully handed over to these proud, joyous islanders their own certificates, reflecting their own, personal levels of achievement, each certificate personalized for the classes they had each attended. All this time as I sat there, I heard the Lord chuckling in the background. You see, when it came time many years ago for me to attend the graduation ceremonies for both my own degrees back in the States, for foolish reasons of a much younger man that I can’t even remember now and would never repeat from my current perspective, I shunned both ceremonies and waited to receive my diplomas in the mail. I have no idea what had gotten into me – I just can’t remember – but I regret these two decisions to this day. But now, here I was, dressed in the finery that the student leaders required of me for their ceremony, the very kind of gowns I had previously shunned, getting ready to hand out graduation certificates to each of my students and celebrating with each one as their family and friends gathered around them to be photographed. I spoke briefly but pointedly about the students’ need to “teach others also” from 2 Tim. 2:2. I also told them that Ugandan churches were on the verge of entering the mainstream of church history by sending missionaries of their own, a development I predict will occur within ten years. I’m pretty sure the Lord set me up for this, one of his time-warping cosmic jokes, gently chiding me for my foolishness so many years ago in missing my own moments of celebration. I was truly humbled to be repeatedly called “the Professor” by students, speakers, and guests alike, and God restored in me that which was lost by the folly of my youth. There are many things I just didn’t know back then before all this started. It is the custom in Uganda to refer to someone who speaks into your life as a spiritual “father,” not as a title but conversationally. God has somehow transformed the overly shy fatherless boy that I know so well from the inside out into the spiritual “father” of a people. I am humbled, deeply, quietly… resolutely. And, I don’t know what extraordinary surprises are next – even today, a travel day returning from the island, was full of them (see “Mama” Gail’s post on the graduation – “The Day After,” coming next).